Dead Space was the last great hope for horror video games when it came out four years ago. Can Dead Space 3 do the same thing in 2012? The first game faced an uphill battle, and it was hamstrung by 2008 being the year that the “survival horror” genre died. After ten plus years of the Resident Evil series and its many descendants and imitators that tried to scare you by limiting supplies and skills while surrounding you with monsters, ghosts, and demons, big game publishers decided that what people really wanted was balls to the wall action. Add in a bit of atmosphere and the odd moment where something jumped out at you, and a new survival horror genre seemed destined to take over. Just look at that year’s line up: Condemned 2: Bloodshot from Sega dropped the taut psychological fear of the first in favor of gore, Silent Hill: Homecoming traded atmosphere and the surreal for slick melee combat, and Atari’s Alone in the Dark ended up an unplayable mess after attempting to include action movie tropes like driving. For fans of horror it was a rough time, but the action-ifying of fright wasn’t all bad news: EA and Visceral Games’ Dead Space turned out to be excellent. Even through Dead Space’s then-silent protagonist Isaac Clarke could slice and dice the mutated freaks surrounding him with a wealth of guns and construction tools, the game was scary as hell. It was also a success with gamers, and spawned several cross-media projects, including animated movies, comics, and more. Dead Space had two things going for it: Isolation and patience. It locked you in the dark bowels of a broken spaceship (or right out in space) and let you wait for something bad to happen all on your lonesome. When the baddies showed up you were ready for them, but the waiting, as Tom Petty says, was the hardest part. 2011’s Dead Space 2 ruined that magic formula, bombarding Isaac with a constant stream of enemies in a forgettable space city. There were a few moments of awe, but the atmosphere was more focused on action than survival. That game had no patience, and unfortunately Dead Space 3 is doing away with isolation altogether. As touted by Electronic Arts at E3 2012, Dead Space 3 is now a co-op shooter. Sergeant John Carver joins Isaac on the planet frozen planet of Tau Volantis, where the two have to fight new hordes of the pointy-limbed Necromorph monstrosities. Continuing the story from Dead Space 2, Issac and Ellie meet up with Carver and follow a trail to what may be the source of the Markers responsible for transforming people into the Necromorphs. The group discover a ruined planetcracker on the icy surface, similar to the USG Ishimura from the original game. The differences between Isaac and Carver are minimal, both cosmetically and functionally. In the level demoed by EA at a recent event, the game looked just like what it was: Co-operative Dead Space. Both players wandered through grimy, dim hallways – the icy surface of Tau Volantis didn’t make much of an appearance – shooting up bad guys in tandem. If you start to die, you call the other player over to help you up like in every third-person shooter since Gears of War. It’s fun, but since loneliness was such a key component of the original, it’s hard to think of Dead Space 3 as anything but another action game in a nicely atmospheric environment. That environment looks great. It calls back to Dead Space and its Wii offshoot Dead Space: Extraction, returning to dank industrial tunnels rather than the almost BioShock-esque hallways of Dead Space 2’s city, The Sprawl. Familiar as it is though, it’s graphically spectacular. I mistook the game for a Frostbite 2 engine game since developer Visceral Games is also busy making co-op Frostbite 2 third-person shooter Army of Two: The Devil’s Cartel. Not so. Dead Space 3 is actually running on a modified version of the studio’s own Visceral Engine which powered Dead Space 2. You’d never be able to tell given how detailed the new sequel’s characters and monsters look by comparison. It will be interesting to see how the co-op aspect fares with a single player. In most games designed around co-op, the second character is just an AI controlled assistant, sometimes helpful, sometimes good only as bait. But for Dead Space 3 Visceral is promising that when you are playing it by yourself, the second character will make several appearances, but the majority of the game you will be alone. Apparently there will also be gameplay mechanics and story elements that can only be accessed as Carver. How this all plays out with the drop-in/drop-out co-op is something we’ll have to judge for ourselves when the game is released on PC, PS3, and Xbox 360 on February 5, 2013. There is hope for Visceral’s new sequel. 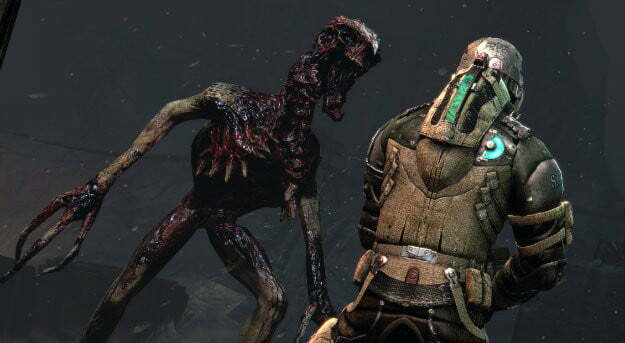 At the end of Dead Space 3’s demo, the game is shaken out of its familiar formula. Dementia has always played a role in the series; Isaac suffered from repeated hallucinations in the first two games, haunted by visions of his dead lover. His psychosis, caused by the alien artifact MacGuffin (The Marker) fueling the series, never affected you outside of cutscenes though. Now Isaac will start hallucinating in the middle of a fight, confused by what’s actually an enemy and what’s a friend, and what in the environment is even there. It creates an interesting scenario for co-op: One player sees a psychedelic wash and people that aren’t there, while the other player just sees them flailing around getting attacked by a very real monster. It has the potential to create a wholly different sort of isolation, using cognitive dissonance to separate players empowered by having back up nearby. The idea’s not a new one. Eidos’ Kane & Lynch series has played with pairing co-op players where one character is unstable and hallucinating. In that case, it didn’t add up to much. 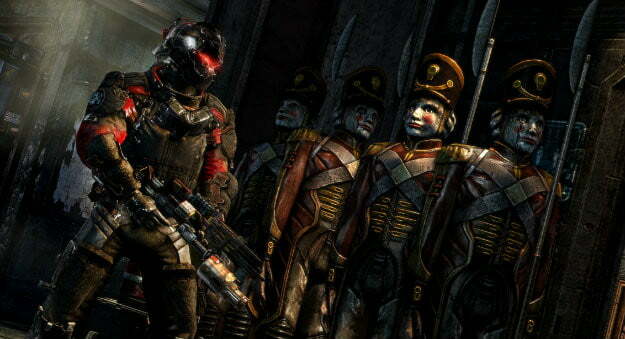 Dead Space 3’s success will be determined on how much Visceral Games is willing to experiment with perception. If the game skews too heavily towards standard shootouts, it could kill what makes the series special for good.